Black Friday is quickly approaching, meaning that eCommerce retailers are busy putting their ducks in a row to ensure seamless conversion-driven customer experiences. This year, the competition will be at its fiercest due to this retail holiday’s global growth. To prepare you for this year’s chaos, we’ve rounded up the most best persuasive marketing strategies for this Black Friday. So, without further ado, our Black Friday tactic Roundup. When it comes to consumer decision, there are cognitive biases at play in the minds of individuals. And given an event such as Black Friday, when every retailer is fighting for the attention of the consumer, it pays to stand out. To do so, brands don’t only need to offer jaw-dropping deals but also help the decision making process by creating a sense of FOMO in shoppers by appealing to their cognitive biases. But knowing which prejudices to target can be tricky. That's why we’ve laid out four persuasion tactics for your Black Friday marketing strategy approaches to winning over customers this Black Friday. Scarcity is one of the most well-known, widely used (and abused) cognitive biases in the marketing field. The idea behind this is that scare products have a higher perceived value, which increases the urgency for a person to act. But since this principle triggers fear to encourage behavior, it is highly disputed. However, when it comes to Black Friday, this prejudice couldn’t be more suiting. Black Friday is attractive because it is a one-day opportunity to buy all the things needed for the coming holiday season. Deals are not only expected to be “once in a lifetime,” but also limited and exclusive. The faster you act, the better the deal you get. Use scarcity driven messaging to create urgency on social media leading up to the event. Have you ever questioned the appeal of the lottery? You can thank the uncertainty of the prize for that. Research has found that rewards that are ambiguous are more powerful in motivating behavior than guaranteed rewards. Seems hard to believe - right? Plus, researchers have found that when an uncertain reward is offered, the thrill of participating increases. However, this is only the case when a person is goal-oriented (i.e., wants to purchase a specific product) rather than in a passive state (i.e., just browsing). So motivating uncertainty, or promoting various potential rewards, is ideal for situations when an individual has already decided to buy a product on Black Friday. Imagine someone is searching for a jacket, they find one they like and land on the product display page. By offering a discount that could be 15% - 20% on this landing page, the sensation-seeking individual will be more driven to act. This approach is lower cost than offering a certain reward because the amount of discount varies per shopper. Meanwhile, it improves the customer experience as the shopper gets the thrill from gambling to see which discount they will receive. Target customers who have shown behavior searching for products that match your discounts. Targeting specific product searches is essential because motivating uncertainty is most effective in individuals who have already opted for a decision. So, if someone has been searching for deals on Playstations, tailor your ads for this product. If individuals are already on your platform, you can use a broader approach by offering discounts on their entire purchase through smart notifications. Who doesn’t love a good deal? There’s nothing like walking into your favorite clothing store and seeing the perfect sweater for only €59 instead of €99. Even if you’re generally a person who wouldn’t spend more than €50 on a sweater, you can’t help but say no to such a great deal. In this situation, consumers are subject to two processes. First, anchoring occurs when an inflated price followed by a drastically lower price is shown. Individuals use the first price as an anchor, or basis, for how much the product should cost. So when they see the lower price, it will seem even lower than if they only saw the discounted price. The second process, price sensitivity, is appealed to by showing the customer how much they are saving. And on Black Friday, customers are driven to save as much money as possible. Facilitating savings mental math will lead to more enjoyment and satisfaction with their purchase. When possible, highlight how much the shopper will be saving. Share the deal through newsletters and social media, expressing how much will be saved. Show original price before the discounted price. Calculate how much will be saved, show this on the product detail page and checkout page. Push specific products’ discounts by setting them next to more expensive items. There is a sense of comfort in looking to others for the right decision. And in situations where there is an overload of choice, it is often the most foolproof way of making a choice. Engaging social proof is commonly used by marketers to highlight products in their catalog. Specifically, the use of visual ratings and reviews have made way for the success of this principle in nudging purchasing behavior. Social proof explains the tendency for individuals to look at other’s behavior to determine their own in new or overwhelming situations. 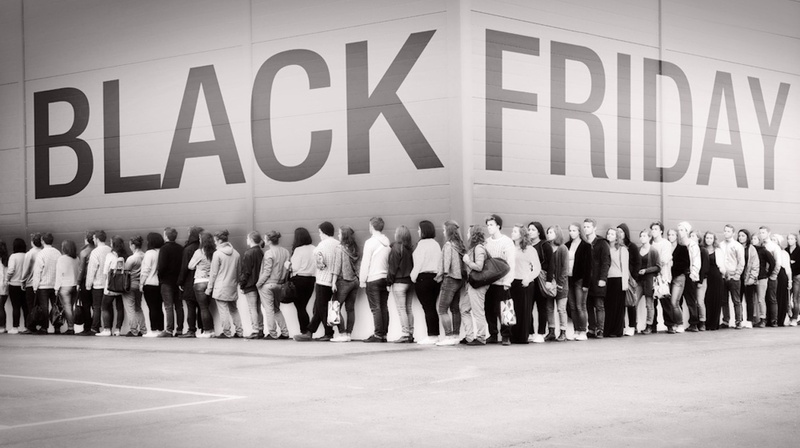 Social proof powers offline Black Friday, as you see with the camping, long queues, and chaos within the stores. 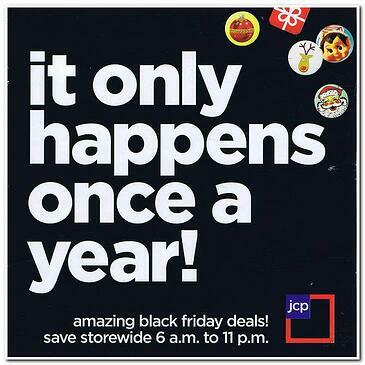 But it also has the power to drive online Black Friday sales if used correctly. Use a referral program inviting your customers and their friends to have early access to your Black Friday Deals. Offer discounts for people who share their purchases on social media. Show the number of times products have been purchased on the product display page. In the end, the framing used to appeal to these biases contribute to creating a feeling of FOMO (Fear of Missing Out) in shoppers. And while some struggle with FOMO more than others, everyone deals with it when given an offer impossible to decline. Appealing to people’s FOMO feeds the apprehension they feel about making the wrong decision. Individuals don’t want to be the odd man out and will often base their decisions on avoiding it. So, by making an offer that cannot be refused, FOMO engages urgency in shoppers, causing them to act in fear of missing out. By posting your discounts on social media, you are already setting the stage for FOMO. But these effects can be increased by using any (or a combination of all) of the biases covered in this article. Keep in mind how your target audience prefers to receive their information. By understanding which biases they are most susceptible to, you can avoid tailoring messages that have adverse effects. Always use these approaches in moderation, no one wants to be overloaded with blatantly persuasive messages. The goal of appealing to cognitive biases is to help shoppers deal with choice overload. A positive user experience should always be a top priority. Interested to see how we use cognitive biases to optimize eCommerce webshops? Check out our white paper on persuasion profiling in fashion retail!